Over the next four years robotics experts will work with language development specialists who research how parents teach children to speak. 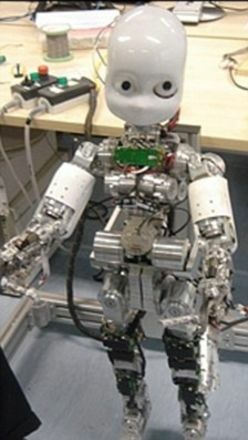 Their findings could lead to the development of humanoid robots which learn, think and talk. The project is believed to be the first of its kind in the world and typical experiments with the iCub robot will include activities such as inserting objects of various shapes into the same shaped holes in a box, serialising nested cups and stacking wooden blocks.